CUPERTINO, Calif. -- Apple Inc.'s bet on cellphone software appears to be paying off. If sales stay at the current pace, Apple stands to reap at least $360 million a year in new revenue from the App Store, Mr. Jobs said. "This thing's going to crest a half a billion, soon," he added. "Who knows, maybe it will be a $1 billion marketplace at some point in time." "I've never seen anything like this in my career for software," he said. Apple has hit a few speed bumps along the way, in part because it has set itself up as a powerful intermediary for the distribution of software to iPhones. For instance, it has frustrated some software developers by removing their programs from its App Store without explanation. Some iPhone users also have complained of technical problems with various iPhone applications, which software makers have attempted to correct with frequent patches. Apple isn't likely to derive much in the way of direct profit from the business, Mr. Jobs acknowledged. It is keeping only 30% of the proceeds from application sales -- about enough to cover expenses from credit-card transactions and other costs of running the online store -- while the programs' creators keep 70%. Instead, Mr. Jobs is betting applications will sell more iPhones and wireless-enabled iPod touch devices, enhancing the appeal of the products in the same way music sold through Apple's iTunes has made iPods more desirable. "Phone differentiation used to be about radios and antennas and things like that," Mr. Jobs said. "We think, going forward, the phone of the future will be differentiated by software." That view is shared by rivals, including Microsoft Corp. and Google Inc., which are working to popularize their own software platforms for cellphones. Richard Doherty, an analyst with market research firm Envisioneering Group, says Apple has caught competitors off guard. "They've lost developers to Apple," he says. Software developers also say they've been surprised by the popularity of their iPhone applications. Videogame specialist Sega Corp. says it sold more than 300,000 copies in 20 days of its $9.99 Super Monkeyball game, in which players guide an orb around mazes by tilting their iPhones. "That's a substantial business," says Simon Jeffery, president of Sega's U.S. division. "It gives iPhone a justifiable claim to being a viable gaming platform." Another hit comes from Epocrates Inc., a maker of electronic reference guides for physicians that has developed a free drug encyclopedia for the iPhone. More than 125,000 people have downloaded the software, including 25,000 doctors, says Michelle Snyder, the San Mateo, Calif., company's vice president of marketing. That compares to the some 500,000 Epocrates users the company has previously said it has on other mobile devices. Mr. Jobs said developers' share of iPhone application sales in the first month was about $21 million, of which the top 10 developers earned roughly $9 million. Some developers, however, have run afoul of Apple's limits on software it will distribute through the App Store. The company recently removed an application called I Am Rich that did nothing but display a glowing red gem, for the eye-popping sum of $999.99. The programmer who created it, Armin Heinrich, says he thought he was abiding by Apple's rules for its developers. An Apple spokeswoman said Apple made a "judgment call" to remove I Am Rich. Apple raised hackles in computer-privacy and security circles when an independent engineer discovered code inside the iPhone that suggested iPhones routinely check an Apple Web site that could, in theory trigger the removal of the undesirable software from the devices. Mr. Jobs confirmed such a capability exists, but argued that Apple needs it in case it inadvertently allows a malicious program -- one that stole users' personal data, for example -- to be distributed to iPhones through the App Store. "Hopefully we never have to pull that lever, but we would be irresponsible not to have a lever like that to pull," he says. 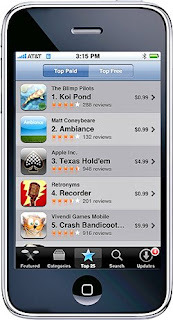 Mr. Jobs declined to give an updated sales tally for iPhone 3Gs, the new model of the phone introduced last month at half the up-front price of the previous $399 model.